As I sat down, the man by the window smiled and reached out for LP’s hand. I have to admit every time a stranger takes an interest in LP I still have a moment of trepidation. I don’t blurt anything out anymore, but I still hold my breath for a second, waiting for that whiff of scrutiny. Mr. Stranger seemed nice. I apologized ahead of time for any yelling LP might do during the flight. He said he had his own kids and seemed genuinely tickled when LP grinned at him. I mean, who wouldn’t be charmed? The kid has an infectious smile. So I relaxed. We made some small talk, Mr. Stranger pulled out a book, we both settled in. And before I knew it, I blurted out that he was six months old. LP is not six months old. He is four days shy of eight months old. I am not sure why in that situation, of all situations, I decided to lie. I’ve never done it before. In fact, I’ve felt open to a lot of awkward conversations about T21 and seen them through, with positive results. I guess I could blame it on being tired from the travel day. Or I could argue that I can’t, shouldn’t even, make every single moment about teaching or advocacy. Or, I can tell you how I felt. I just didn’t want to do it. I didn’t want to carefully parse my words, to gently suggest to Mr. Stranger that milestones don’t really mean anything and that maybe it is just a wee bit rude to go and ask a total stranger where her kids is developmentally. I didn’t want to have to consciously decide to smile instead of rolling my eyes. I didn’t want to have that fleeting moment when I debate whether to utter the words “Down syndrome” and wait for the flicker of pity. But… I don’t really have an excuse, and it really shouldn’t be about my feelings. It was selfish. I lied only for my comfort, and I’m sorry. Truthfully, I don’t actually know how that conversation would have gone, had I chosen to tell the truth. I had no idea where our conversation would have ultimately gone. I let myself get worn down by other people’s frustrating comments that I let myself judge that stranger based on nothing to do with him. Sorry, Mr. Stranger. My kid rocks. You could have rocked, had I given you the chance. I was in the grocery store yesterday with both twins in the cart. They were doing their own thing when a lady stopped and asked “are they twins?”. I could see the slightly puzzled look on her face, just for an instant. W continued his barrage of raspberries and reached out for the lady and grabbed her finger. Z said “Hi There!” and each communicated with her in their own way as she told us of missing her grandson and how she was looking forward for him to come home soon from a cottage vacation with his father. As beautiful as this moment was, I was on edge the entire time. Would she ask? Would I have to go into my son’s karyotype right here, by the packaged ground beef? Would I have meet this nice lady’s potential misconceptions head on? Instead she talked nicely to both children and headed off. We would cross paths a couple of times through the store and both kids would wave and say “hi” in their own way. Am I a terrible person for thinking the worst some days? Possibly. I also know that I have been blindsided more than once by something simply terrible in just such an encounter. Maybe you were tired. Maybe you didn’t want to have to “deal with” the questions on the way home. Maybe in your mind, that was the easiest way for Mr. Stranger to relax and enjoy LP for who he is. Yeah, that is it exactly! Wondering if the person is going to turn and say something awful. I don’t want to miss out on the beautiful moments either, I’ve had plenty of both already. It’s a constant thing, trying to be open to the world. Sigh. Ah, don’t let this moment get you down. I have found I honestly have to be in the mood to answer questions from strangers about Russell, and I have done the very same thing you have here. I’ve told a small fib just to get out of having a deep conversation I wasn’t in the mood to have. It’s ok to do that. 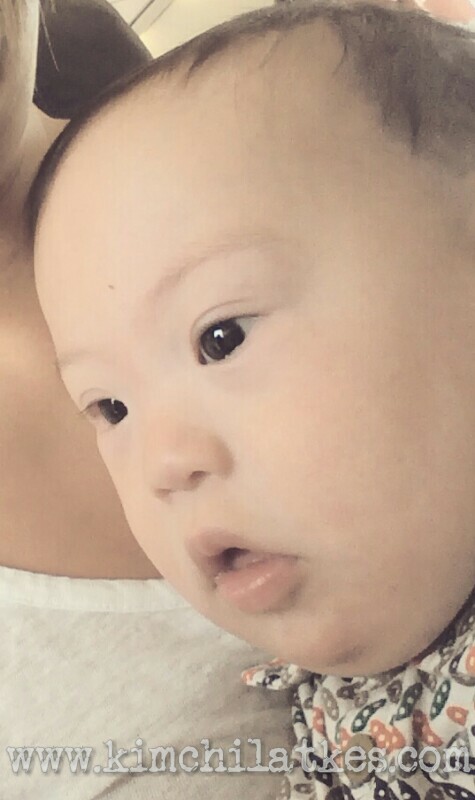 I also decided a long time ago that I refuse to spend every waking moment teaching others about Down syndrome. I decided to let Russell’s life show people…Let them see who he is, let them learn from that. As parents we want to advocate and educate everyone around us about how awesome our kids are. But it’s a balancing act in many ways. Our kids are not giant Down syndrome projects that we need to talk about or show people all the time. They’re children. They have lives to live too. I guess I have learned to respect that Russell has a right to not be talked about 24/7 in that effort to educate. I say, pick and choose your moments, but don’t feel obligated every time to have a discussion with people about LP. I know it’s tough. I feel like I’m always on edge when someone new is around my baby and worried about what they are going to say and just not wanting to get into it. I don’t think you did anything wrong, and you shouldn’t feel guilty about it. I’m very reserved around strangers- a quick smile or nod is enough for me, and I dislike people asking me questions about my kids (or offering unsolicited advice). The whole concept of “milestones” is ridiculous- similar to the way adults only think about kids in terms of what grade they’re in. I try to be honest, and instill it in my kids, but we also talk about how it is sometimes appropriate to be less than honest. I’ve done it too! I think sometimes I just want to enjoy my son rather than talk about what most people would consider to be ” wrong” with him. Like it or not I don’t think that a majority of the general public see him for anything other than his ds, which I hope is something that will change as a result of this generation of kids with ds! To me he is simply my son and sometimes I just don’t want to get pity or into a discussion but on the other hand when I do usually good things happen. One other note on this is that I often feel when someone meets him for the first time that I need to list all his ” accomplishments” how ridiculous! He has value in who he is and in that alone but I want them to see how far off their stereotypes are, this is definitely something I need to work on! I almost laughed when I read that you lied about his age because it caught me off guard. Don’t be so hard on yourself. I don’t think I’ve ever lied about Finn’s age, but I know that feeling of just not wanting to deal with the looks, the questions – of not wanting to deal with “the conversation.” It’s valid. While I understand your feeling that you should have given the guy the benefit of the doubt, you certainly didn’t harm anyone by not. It’s okay – go easy on yourself. That is an angle I hadn’t thought about – if the girls had heard you. Do they know that LP has Down syndrome? I know it’s always a weird thing, contemplating telling the other kids, wondering how and what to tell them and how much they’ll understand about it. You know, we haven’t had a “sit down” over it. Honestly, I’m not sure what they know. We absolutely do not hide our discussions about it. We decided not to sit them down and say anything because at 4.5 years, we felt that no matter what words we used, sitting her down and telling her in that way would send the clear message that something is “wrong”. Strangely, she has never once asked about it. We have talked about the medical stuff with her, but she never asks the next “why” question. Yeah, nonsense. Pfft. Anyway, I hear you. I remember after Finn was born, how Michael and I struggled with what to tell the other kids. It was different for us because Finn had to have surgery right away and stay in the NICU after being born at home, so they knew that something was wrong. I think we ended up just having a frank conversation with Kevin when he noticed some books we brought home from Barnes & Noble about Ds – but he was 11.5 at the time. I honestly don’t remember how/when we told Joey, who was 6 when Finn was born. I know we didn’t say anything to the girls for quite a while – except about the medical/hospital stuff – because they were so young and we didn’t figure it would mean anything to them at the time. I think we just told them gradually over time as they began asking questions.